Between them the horses jumped every day apart from Wednesday, when Judy and Malcolm gave me a hand with them at home. Even on Wednesday there was lots to do, having ridden the three horses, we had several Old Lodge horses to watch, and I then had a sit on a lovely event horse who is currently at the Pyrah’s. Malcolm was slightly surprised when I jumped him straight into his water jump, like a proper eventer!Packing up for 5 days at Arena UK with Ferro, Biscuit & Emma brought back memories of packing for three day events. Luckily Malcolm Pyrah had kindly offered to have us all to stay so I was saved from taking haylage and shavings. Having borrowed a friend for Homer from Karen Rees, I set off at 5.45 on Monday morning. The impeccable Lewis sense of timing ensured that I arrived just after 10.00 so that I couldn’t walk either of my courses, but luckily it is relatively easy to learn courses in all weather arenas when you can see the whole way round. I put my numbers down, got a cup of coffee, established when the Old Lodge horses were jumping and got the horses ready. 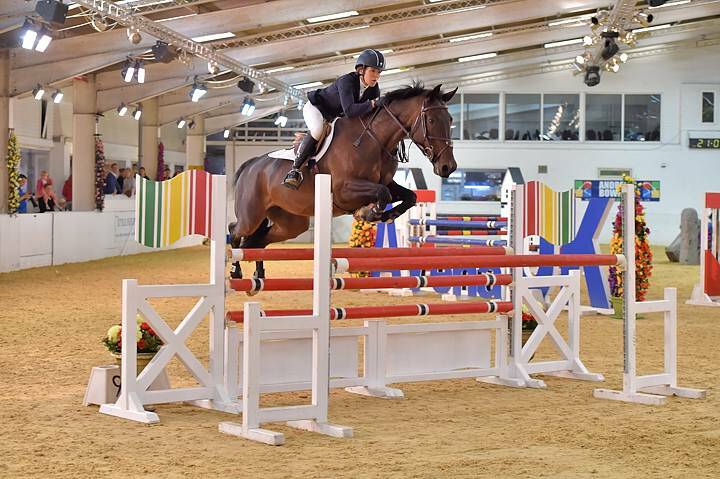 Emma and Biscuit jumped in the Newcomers, and Ferro in the Amateur 1.20. After the wide open spaces of Hickstead the arenas seemed small, and incredibly full of jumps, with lots of other distractions as all the arenas are close together, with lots of people, push-chairs and horses everywhere. By the end of the week Biscuit and Emma had grown up so much. Biscuit can now get past any flag, pushchair or umbrella with no fuss at all, and by the time Emma jumped her last class she not only jumped a fantastic double clear to qualify for the 5 year old Grand Prix but also behaved perfectly at the practice jump. Progress had been achieved at a small price as I shot off her so quickly on Tuesday, and hit the side of the school so hard that I got a splinter in my bottom. 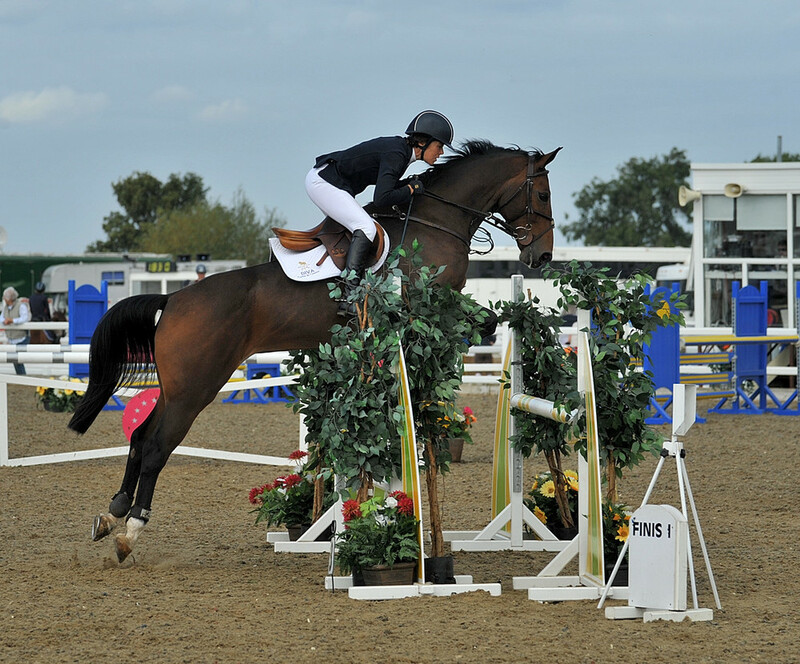 The standard of jumping was very high, with well over 100 horses in every qualifier. Biscuit only just missed out on qualifying for the Newcomers final, Emma qualified for the 5 year olds, and it seemed a bit mad to gallop Ferro about to qualify for the 1.20 right at the end of the season.Having grown up not a million miles from Grantham, I was ready for the North East wind at Arena UK – there really aren’t many hills between there and Siberia. By the end of the week I was wearing thick gloves and two coats – not quite at the woolly hat stage like some people – but well wrapped up. By Thursday and Friday it was raining as well as windy. I managed to jump Biscuit in my jacket, but by the time I got on Emma the water was running down my back and the season ended with yet another round of showjumping wearing a raincoat! I am now home, the girls are ready to be roughed off, and I am slowly cleaning all the show rugs, numnahs and travel stuff to put away ready for next season. The rain has arrived and so now I’m looking forward to taking Homer autumn hunting, watching the girls getting fat and hairy and looking back over the competitive season. My main goal at the beginning of the year was to try and become competent at 1.30 – and I haven’t really managed that. I’m not giving up, but I know there is lots more to do. On the plus side I have managed to be placed at a higher level than before, and there have been a few 1st rosettes. Biscuit has gone from zero to nearly a hero in just under a year, and Emma continues on her course to be a very competitive prospect. She is now known as the Grannies’ pet as both Zandra, my stepmother, and Janie, my mother-in-law, love her.